The military press is a classic strength training exercise that has stood the test of time. Not only does the lift build strong and muscular shoulders, it transfers favorably to the bench press, and it actually works a lot of muscles you wouldn’t always think of when considering the strengthening effects of the military press. That being said, when it comes to upper body training, the military press is one of most poorly performed exercises. Most lifters go too heavy, forcing themselves into excessive lumbar hyperextension, with the resulting lift looking more like a standing incline chest press. Not every individual is well suited for military pressing. However, many lifters find that if they work on technique and perform specialized exercise to help improve their overhead mechanics, they can learn to press overhead safely and efficiently. One factor that prevents proper military press performance is the lack of requisite shoulder and thoracic spine mobility required to get into position for a proper military press. Poor overhead mechanics can be the result of tight pecs and lats, as well as weak or inactive traps or thoracic extensors. If this is the case, you may want to perform some self-manual therapy, shoulder mobility drills, t-spine mobility drills, and lower trap activation drills in your routine to help you get into position a bit easier. Assuming you have good shoulder and t-spine mobility and scapular control, let’s take a look at how to execute the military press with good form. The military press looks simple enough, but there are many nuances that lifters miss out on, which can greatly diminish strength gains and overhead potential. Here I’ll show you how to set up, and how your body should move when pressing overhead. Grip – The grip is crucial when setting up for a military press; if you go too wide, as many lifters do, you’ll be at a disadvantage from the start. Gripping too wide may also place undue stress on the shoulders. You want to place your hands somewhere just outside shoulder width, and be able to maintain a vertical angle with your forearm, meaning the elbow is directly under the wrist. The wrists should also remain neutral for the most part; you want to minimize how much the bar pushes your wrist into extension. 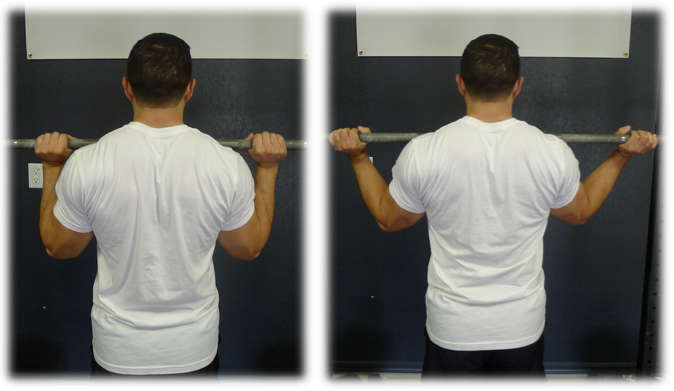 Bar Path – Once your grip width is set, you’re ready to get under the bar. The bar should start at the base of your neck. There is, however, some wiggle room for this. If your forearm length is freakishly long in relation to your humerus, the bar may start just under your chin. 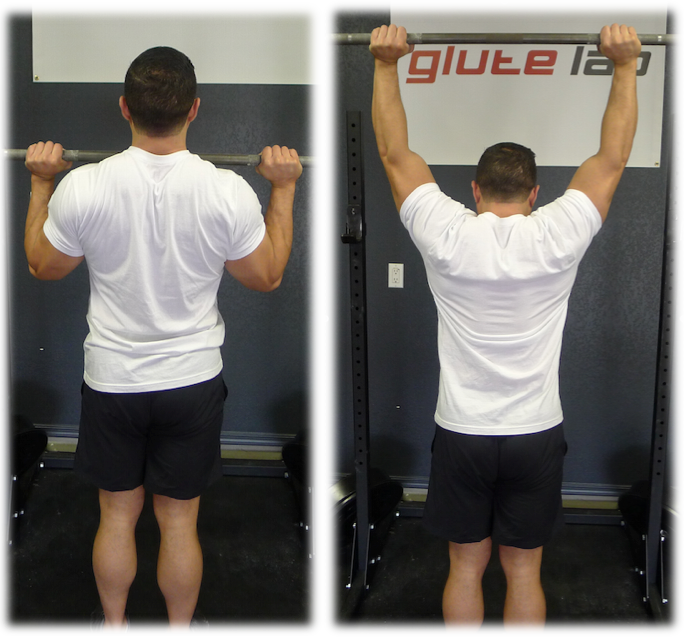 This applies to chin-ups as well – those with disproportionately long forearms will have trouble getting their chin over the bar, this does not mean they’re not achieving full ROM. Another factor is muscle mass – bodybuilders, strongmen, and powerlifters with huge biceps and forearms will need to go wider and may not be able to start from the top of the sternum as their ROM can sometimes be limited. Also, make sure you maintain thoracic extension with the scaps “sticky” on the ribcage. You don’t want the shoulders to roll forward (scapula anterior tilt) – keep the elbows under the wrists. When set up correctly, the bar should be under the chin, meaning if you were to press the bar without tilting your head back, the bar would hit you square in the jaw. On the way up you should have to tilt your head back slightly, and the bar should skim your face, almost scraping your nose. At the very top, there are two options, an Olympic style finish or a powerlifting/bodybuilding style finish. With the Olympic style finish, the bar will arc back slightly, and you’ll push your head through the gap created by the arms with the elbows completely locked out. If you choose the powerlifting/bodybuilding style finish the bar path will remain vertical and straight throughout the lift; be aware that this style has a bigger tendency to create lumbar hyperextension though. Elbows – At the bottom of the military press, the elbows are tucked directly under the wrists, angled forward slightly, and almost resting on the ribcage. As you press up, you want the elbows to flare out slightly so that they are wider outside of the delts, and pointing horizontally at the top of the press. Conversely, on the negative you want to smoothly rotate the elbows back in so that they are tucked back in and angled forward once you return to the start position. Shoulder Blades – The movement of the shoulder blades during the overhead press is an area of confusion for many lifters, as there are some coaches that cue the shoulders back and down and others that cue actively shrugging and upwardly rotating the scapulae at the top. I believe that without good upward rotation of the scapulae, glenohumeral joint congruency is harder to maintain and also opens up the door for subacromial impingement, which makes cueing the upward rotation of the shoulder blades essential. When going heavy, however, it will be difficult to achieve a great degree of upward rotation, although you are still actively trying to engage the traps and shrug as much as possible. Just make sure you’re not actively working against the shoulder blade’s natural rhythm by preventing upward rotation. Stance – In regards to foot placement there are a couple options, but for the most part, you want them around shoulder width apart. Going too wide can make the lift feel awkward, and placing them too close together won’t provide a big enough base of support, which can make balance an issue. The second option, is to split the stance slightly, with one foot slightly forward of the hips the other just behind. This will feel the most stable for some lifters, so experiment with the two and find your ideal stance width. 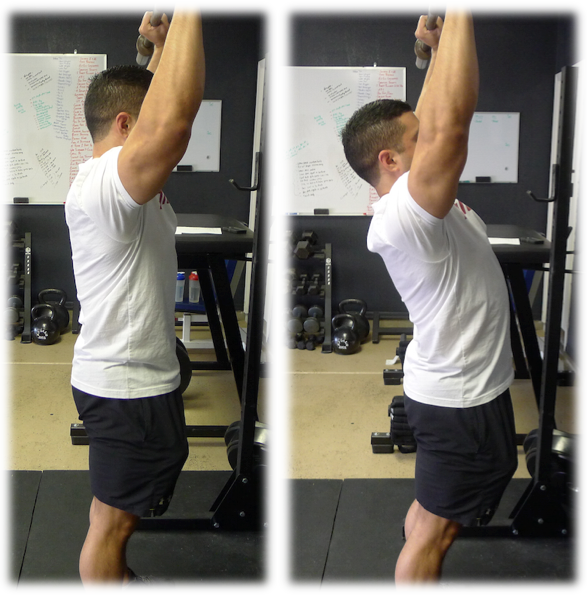 Core Control – The military press is primarily a shoulders and triceps exercise. However, it does require a fair amount of activation from the core to ensure proper spinal and pelvic mechanics. As previously mentioned, many lifters allow the weight to push them into lumbar hyperextension rather than buttressing the load with the core and keeping a more upright torso. Just before initiating the press, brace the abs and squeeze the glutes – this will ensure that the core is stable and prepared to transmit the forces into the legs efficiently. It can be helpful to think about pushing yourself into the ground against a fixed bar, rather than simply lifting the bar overhead. Support Work – As with any exercise, strengthening the individual components separately can improve performance in the lift, as it is sometimes easier to overload the various regions through targeted movements. Here are some of my favorites. Please watch this 7-minute tutorial on how to military press efficiently. If you’ve been having trouble with the military press, as many lifters do, take a step back and start by lightening the load. Hone your technique and build your strength back up, making sure to not resort to old motor patterns. If you do so, I suspect that the military press will feel better and your strength will continue to climb. And remember – a strong and well-performed military press just looks badass. That’s all there is to it! Thank you for posting all these super lessons. They are terrific tools and it’s great that you offer them for free. I recommend your site to anyone who will listen, and hopefully you’ll get a couple of sales out of it. Keep doing what you do, my man! I used to wonder why the heck I couldn’t overhead press, as I was putting my shoulders “back and down my back.” Turns out, this was not helping my already overly-winged scapulae at ALL. Now that I start in the correct position, it’s still not perfect, but it’s definitely much better! Thank you very much!!! Not too many videos on MP technique out there (altough i’ve found some)!! Appreciated!! KEEP DOING THESE, THEY’RE VERY VERY GOOD! Question – i’ve been taught by my second couch since i was young, to always… how should i say it… Create a shouler shelf for the bar using my LATS in a “bumping” way that they expand and make the scapula shrug a bit – but the interesting part is that my upper traps are RELAXED, and my back seems like the Bodybuilder’s “V” shape. As far as i remember he got that one from Staring Strength (i still cant believe i havent read this book actually). Question is – is it legitimate/good idea to do this shoulder shelf (while STILL KEEPING elbows under the bar, not in front like a Clean & Jerk) and if yes/no – why? –Notice that my military has always been kinda weak. I weight 110kg – can deadlift 200kg, squat bellow parallel with 140-150kg, bench press with 100kg — but my OHP is about 65kg max. Which means that my form might need correction, but i want to know the anatomical reasons for this! but Bret – you are one of the very knowledgeable, humble yet helpful people i know – so if someone is authorised (at least for me) to give his opinion and view – that is YOU, my friend! You don’t “have” to answer me, but i would certainly love to hear YOUR words on this. concerning the lagging performance: there probably are various reasons, for example technique (your questions hint at that), training and genetic, the latter having long levers of forearm and arm. What would a goal for a strict overhead press be? Goal of a bodyweight press? or should it relate to the bench press? Example I can strict overhead 180 lbs and bench 230 at a bodyweight of 190. Or Is there a ratio that you would prefer? Thanks really enjoy the way you go in depth on your exercise videos. What do you think about handstands? Bret nice post on pressing. I think the most valuable component that you pointed out that many neglect was the preparation at the very beginning. Utilizing the lacrosse ball on the lats and chest along with a bit of mobility work prior to pushing the iron overhead makes a huge difference. The soft tissue/mobility work is something that I hammer home with folks all the time. It’s frustrating when people fail to do this on their own and then complain about having experienced discomfort from stiff muscles in the neck. It’s a valuable part of training that everyone should adopt as part of their preparation. Thanks for sharing. Bret, WTF? You mean to tell me that bending over backwards and doing a air bench press is incorrect? Dammitt! Good stuff! Your video is a must watch on this one as you get across some points that aren’t as clear in the text. As someone who has had numerous neck strains and plenty of shoulder pain associated with overhead pressing (neither of which are a problem anymore), I would echo your point that the Oly style (head through) is much preferred. It allows the anterior cervical muscles (scalenes) to activate and create cervical stability and puts the c-spine in a “better” position. Powerlifters have to do what they have to do but the more extended cervical position is a more vulnerable to injury position. Also good point about not letting the elbows “flare out” to early – I have found that to be an important piece to minimizing shoulder discomfort, much more so than worrying about what the scapula are doing (shrugged, depressed, or whatever). Great article and video Bret! Thanks for all your hard work in making these videos and writing these articles. It’s interesting to note that before there was bodybuilding there was physical culture and in some of my old literature they instruct one to keep the feet together and encourage spinal extension. Some of the old timers got some impressive numbers in this manner but obviously with more knowledge of human anatomy and proper biomechanics things have changed quite a bit. Bret, the best thing I like about your article is the prerequisite. Seriously, so many people just assume movement is present and all that needed is coaching. Obviously, too many miss on reflex stabilization in the scapula and the ability to have thoracic extension and instead they build strength on top of stiffness – thinking that the pain they get in the lower back when they press is a sign of weakness (so they do more…). So important to get the prerequisites right first. Bret: why do you choose to use a barbell over dumbbells for shoulder presses? Also, any comments on doing it standing v/s seated? 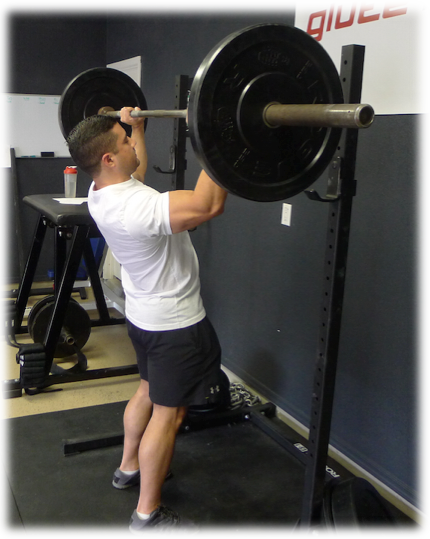 We actually love all overhead press variations…barbell, dumbbell, standing, seated, etc. Thanks for the succinct and effective article. What would you recommend as the optimal amount of knee flexion ? I umderstand we need to avoid excessive flexion and extension. Can the knees be soft but not locked like in a hinge or does it need to remain stiff and locked out ?